The Lino Oldrini indoor stadium, known today as Pala- Whirlpool, is the main covered stadium of the city of Varese, Italy. It stands as a true temple of basketball and hosts Pallacanestro Varese's home games. The Lombard club, one of the top teams in Italy and Europe based on the number of consecutive victories, needed to equip its stadium with a video surveillance system in keeping with the importance and prestige of the games it normally hosts, from those of the Serie A1 premier national league to international matches; a system capable of ensuring maximum security for spectators in strategic areas of the stadium. The system designed by Trium Security Consulting, an Axis partner, employs a total of 45 cameras (of which 16 for outdoor areas) all being latest generation, high quality devices with HDTV resolution. The cameras have been installed in strategic areas of the zones allocated for guest supporters and on all the stands. Video stream management is handled by AXIS Camera Station software, a complete package for the monitoring, recording, replay and management of events. Trium uses experienced staff to provide ongoing on-site and remote support. The adopted solution ensures extremely reliable and complete IP video surveillance, capable of ensuring control of the stadium's indoor and outdoor areas and providing comprehensive security for the public attending the events, while at the same time protecting the stadium from unauthorized access and vandalism. The PalaWhirlpool is the largest covered stadium in Varese, with 5,300 seats. It has hosted the home games of Pallacanestro Varese, one of the most titled basketball teams of the Serie A1 premier Italian league, since 1964. The club decided to enhance the stadium, which over the years has become a true temple of Italian basketball, by equipping it with a digital video surveillance system in line with the importance and prestige of the hosted matches to ensure security for the public on the stands and to protect the stadium from unauthorized access and vandalism. Thanks to cooperation with Trium Srl, an Axis partner installer, the indoor and outdoor areas of the PalaWhirlpool have been equipped with a total of 45 high-quality Axis cameras with HDTV resolution. The cameras were installed on the trusses that support the playing area's lighting system, in the museum, in the corridors, in the area assigned for guest supporters and on all the stands. AXIS P1357 cameras were used for the trusses, enabling coverage of a vast area and providing high-detail 5-megapixel images. The corridors are now monitored by inexpensive and easy to install AXIS M3004 cameras with fixed dome and an ultra-compact design that fits in the palm of a hand. 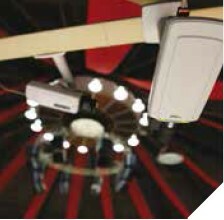 The installers opted for fixed-dome, HDTV AXIS P3364-V cameras, light-sensitive and vandal-proof, with remote zoom and focusing functions for the indoor entrances, while equipping the outdoor entrances with AXIS P3384-VE cameras, which have extraordinary video quality facilitated by Wide Dynamic Range (WDR). Lastly, in the upper ring, fixed, mini-dome AXIS M3007-PV cameras provide detailed, high-quality panoramic shots with 360-degree or 180-degree angles and up to 5-MP resolution. The external perimeter of the stadium is also under strict and complete video surveillance: nine fixed AXIS P1355-E cameras were installed and four PTZ Full HD cameras (the AXIS Q6034-E) were mounted on the lighting pylons and at the stadium's entrances and exits. The HDTV quality of the high-resolution video surveillance, the Day&Night function, H.264 format and high zoom mean that these areas are monitored in the best way possible. All of the cameras are based on open standards and connected via optical fiber, with point-to-point connections via copper cable or Wi-Fi. In particular, the cameras installed on poles outside the stadium are cabled. Axis cameras, with their sturdy design and extraordinary light sensitivity, have proven to be ideal for both daytime and nighttime shooting. In addition, P-Iris technology, an innovative diaphragm control system, has enabled higher contrast ratios and a better field of view for an ever-increasing standard of quality. Finally, for video stream management, the AXIS Camera Station software package was chosen for system monitoring and recording. This enabled Trium to install and configure the cameras via a special guided procedure for event configuration and efficient management of the Axis network video equipment in the system at all resolutions and frame rates.